This is the first game in the Final Fantasy series. For other games in the series see the Final Fantasy category. Final Fantasy (ファイナルファンタジー, Final Fantasy?) 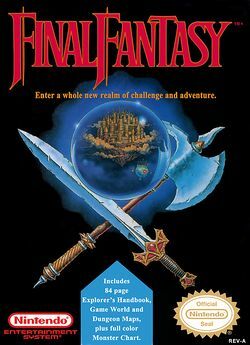 is a fantasy role-playing video game created by Hironobu Sakaguchi, developed and first published in Japan by Square (now Square Enix) in 1987 for the Famicom. It is the first game in Square's Final Fantasy series. Originally released for the Nintendo Entertainment System, Final Fantasy was remade for the MSX2 and WonderSwan Color. It was later released on the Game Boy Advance as part of a compilation called Final Fantasy I & II: Dawn of Souls. In 2009, it was released for the Wii via the Wii Virtual Console service. It was later made available on iOS. The story follows four youths called the Light Warriors, who each carry one of their world's four elemental orbs which have been darkened by the four Elemental Fiends. Together, they quest to defeat these evil forces, restore light to the orbs, and save their world. The game received generally positive reviews, and it is regarded as one of the most influential and successful role-playing games on the Nintendo Entertainment System, playing a major role in popularizing the genre. Praise focused on the game's graphics, while criticism targeted the time spent wandering in search of random battle encounters to raise the player's experience level. All versions of Final Fantasy sold a combined total of two million copies worldwide by March 2003. This page was last edited on 27 June 2015, at 22:19. This page has been accessed 477,000 times.